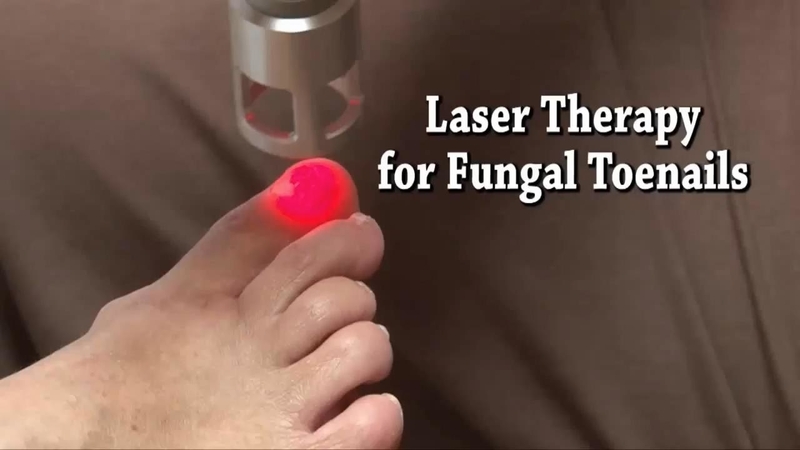 Do Toenail Fungus Lasers Work? Dr. Jeffrey Adler says that his recent study of the LightPod Neo by Aerolase showed a 90% success rate in patients with toenail fungus. To conduct the clinical study, Dr. Adler focused on 200 onychomycosis-infected toes over a 14-month period. He treated the nails with a toenail fungus laser twice, spaced 30 days apart. After laser treatment for fungal nails, patients used a topical antifungal and a UV shoe sanitizer to destroy any remaining fungal bacteria and prevent re-infection. These two complementary treatments cannot cure toenail fungus on their own, but are often used as part of comprehensive toenail fungus therapy. Two doses of painless laser treatment cured 90% of Dr. Adler’s patients, who showed negative test results for toenail fungus. Eighty percent of the 10% who did not respond to the first round found toenail fungus treatment success after a secondary round. The most frequently-cited study of toenail fungus lasers to date was a 2010 study that appeared in the Journal of the American Podiatric Medical Association. It was a small study that looked at just 26 infected toes ranging from mild to severe. After six months, 85% of the toenails showed signs of noticeable improvement. At $1,000 Per Treatment, Are Lasers Worth It? – You don’t think you can stick with applying a daily cream to each infected toenail every day for months. – You have had trouble with your liver in the past and feel worried about taking oral pills for nail fungus. – You want a quick, one-time treatment that requires no additional work on your part. – You are willing to invest in the other products necessary to prevent a recurrence. Don’t Spend A Single Cent On Toenail Lasers Until You Read This! No matter which type of toenail fungus treatment you choose, you will need to wait for the old fungus nail to grow out and the new fungus-free nails to grow in. As strange as it sounds, the new healthy nail will not get re-infected by the fungus portion of the nail because the live fungus on this yellowed, crumbling nail gets killed off during laser treatment. However, there is often insidious fungi still lurking elsewhere! The fungus can be clinging to your bed sheets, harbored on your towel, sticking to your socks, and procreating in your shoes. Yuck! The good news is that a trip through the laundry machine with hot water and antifungal detergent should eliminate much of the problematic residual fungus. The one exception is your shoes. We cannot simply toss our shoes into the washing machine to sanitize them without wrecking them. That’s where the SteriShoe UV shoe sanitizer comes in handy. Simply stick the UV device into your shoes, stick your shoes in the shoe bags provided, plug the cable in, and click the “on” switch. Forty-five minutes later, the device will turn off and your shoes will be free from up to 99.9% of the fungus, bacteria and other microbes. We recommend running the cycle twice the first time you use it to be sure you’ve killed off everything. Diabetic Foot Infections: Should You Opt for Antibiotics or Surgery? Scientists Create Cheese Made From Foot Bacteria!